Mechanical meltdowns, carnage, and a track surface that switched from grippy to grip-less in the blink of an eye – the fifth round of the 2015 Formula Drift Pro championship held in Seattle, Washington, had it all. But at the end of five tough rounds of battle competition, it was our very own Fredric Aasbø who stood atop the podium at Evergreen Speedway. The win, following on from a third place qualifying performance from ‘The Norwegian Hammer’, catapults Aasbø to the top of the points with just two rounds in the Stateside Pro series left to play out. Friday’s qualifying session saw Norway’s Kenny Moen take control with an 89 scorecard, followed by Ryan Tuerck in second and Aasbø in third – both scoring 87. It was a promising start for Tuerck who came into the round leading the championship, but it just as quickly turned sour when the Retaks Scion FR-S driver blew a diff in his Airforce Top 32 battle against Geoff Stoneback. Evergreen Speedway sits around 45 minutes Northeast of Seattle in the city of Monroe, and is home to the annual Washington State fair. 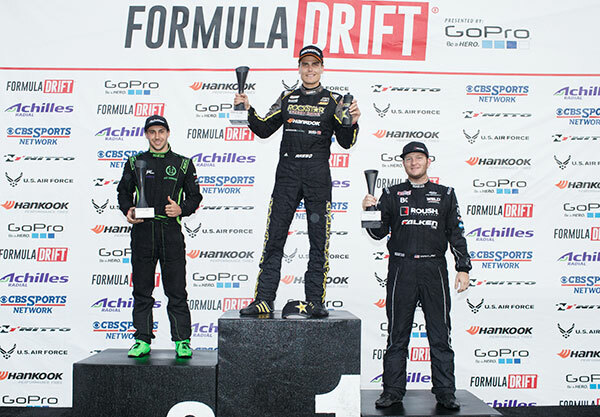 In years past, Evergreen has awarded the first Formula Drift career podium or event win to more drivers than any other event, continued last season by Dean Kearney earning his first career podium. Posted in Behind The Scenes | Tagged Aurimas Odi Bakchis, Evergreen Speedway, Mike Whiddett, Nitto Tires, Round 5, Vaughn Gittin Jr.